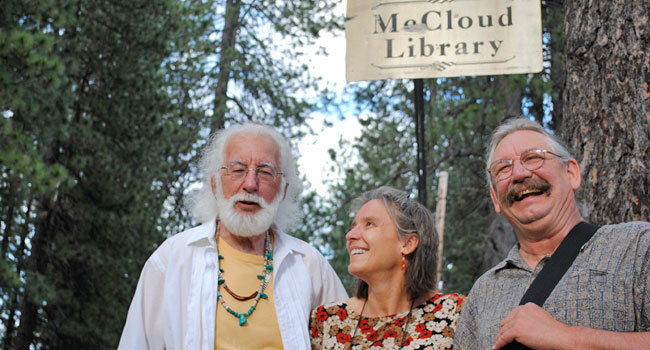 “Cover 2 Cover’s” latest event “Languages of the Heart” was a huge success at the McCloud and Dunsmuir libraries. Both towns are located in southern Siskiyou County in far northern California. These rural communities showed support by “packing the house” and giving generous donations. “Cover 2 Cover” reported that over $300 dollars were raised. “Languages of the Heart” featured Doug Von Koss (poet) and Tom Scott and Leslie Tift (duo acoustic musicians) for a 2 hour show. “Friends of the Library” donated home baked goods to serve the attendees during intermission. Again we thank everyone for their support….More library news to come!! ~ by tomandleslie on July 3, 2011.